Liverpool SolFed stands in solidarity with striking RMT members and ASLEF members refusing to cross the picket line. The full context of this dispute is scandalous – corrupt local politicians are allowing Merseyrail to take up to a quarter of all passenger fares – profits in the region of £14 million a year – and making us pay for new trains. It would cost only £5 million a year to keep guards on the trains, keeping us safer and preventing the loss of 220 jobs – safety critical guard roles. RMT gave Merseyrail plenty of time to negotiate, the company have shown that they would rather put their profit before your safety. The disruption to services is entirely down to Merseyrail management and their dodgy private owners Serco and Abellio. If Merseyrail wins, we all lose out – except of course for Serco and Abellio. 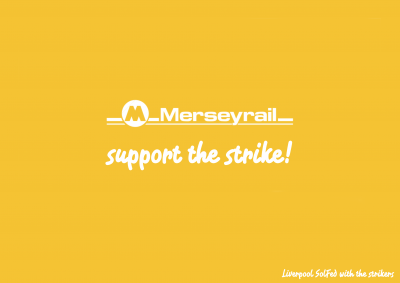 We urge you to show solidarity with the striking workers, join them on the picket line, let Merseyrail know what you think about putting their profit before your safety. If you were planning to use Merseyrail on Saturday you can find alternative routes – demonstrate to the company, to the corrupt politicians in the pockets of the private companies and to the scab drivers that Liverpool support this action and WE WANT TO KEEP OUR GUARDS!